Pasadena is perhaps best-known for its annual New Year's Day parade and as the home of Cal Tech University. It carries an air of early twentieth-century elegance and is home to some of the best Arts and Crafts-style architecture you'll find anywhere. You can plan your Pasadena day trip or weekend getaway using the resources below. Why Should You Go? Will You Like Pasadena? Pasadena is a good getaway spot if you love architecture, art or public gardens. Those who are technically curious may also like it, but need to plan ahead to get the most out of it. Pasadena can be hot in summer. Because of its location near the foot of the mountains, where the air tends to settle, it can be subject to poor air quality anytime. If you've only got a day in Pasadena, you'll find something for almost everyone at The Huntington Library and Gardens. Their European and American art collection includes Gainsborough's The Blue Boy, Mary Cassatt’s Breakfast in Bed and Edward Hopper’s The Long Leg. In the library, you might find a letter written by Charles Dickens, a copy of the Gutenberg Bible or a special edition of Audubon's Birds of America. The Huntington gardens, gorgeous year-round, outdo themselves when camellias bloom (early February). You'll even find a fun children's garden where the little'uns can run around and have fun. Art: The Norton Simon Museum downtown has an impressive collection of artworks but is small enough that seeing it all won't exhaust you. Focusing on art from Asian and the Pacific Islands, the Pacific Asia Museum is one of only four of its kind in the United States. Rose Bowl Flea Market: Held once a month on Sunday, this 40-year-old event attracts 2,500 vendors and up to 20,000 buyers, creating a fun atmosphere even if you don't buy a thing. Architecture Lovers: Pasadena's Gamble House, designed by architects Greene and Greene is an Arts and Crafts-style beauty that's enough to make an architecture lover swoon. Santa Anita Park: The scene of some of legendary racehorse Seabiscuit's most famous races, it's still a busy place today. During racing season, you can take a tram tour of the barn and grounds on Saturday and Sunday mornings. Technically Curious: There's not as much for techies as you might expect in the home of Cal Tech and JPL, but a trip to nearby Mt Wilson Observatory to see the telescopes that revolutionized twentieth-century astronomy is worth a trip. You can tour the Jet Propulsion Laboratory, but only on Mondays and Wednesdays. You need to plan ahead for the tour and must speak with a Public Services Office representative in person by calling 818-354-9314 (email and voice mail not allowed). January: Rose Parade and Rose Bowl Game are held on New Year's Day (January 2 when the first falls on a Sunday). Summer: MUSE/IQUE holds an outdoor summer concert series that many describe as being like a big, outdoor dinner party with music. November: The quirky Doo Dah Parade originated as a parody of the Rose Parade and quickly became a tradition. It's a fun thing to watch, with a lively bunch of participants. Crowds are small enough that you can walk up just a few minutes before it starts. The date changes every few years, and I suggest you check their website to find out the current status. Unless you're going to the Rose Parade, avoid Pasadena at New Year's when it's overrun with parade-goers. Caltech commencement also brings a lot of visitors to town, held in early June. Many sources recommend South Lake Avenue and Old Town Pasadena for shopping. Both are pleasant, but the shops are mostly the same as the ones you'll find in any big shopping mall. Download useful apps to help you look like a pro. Check out the best apps for your trip to Los Angeles. 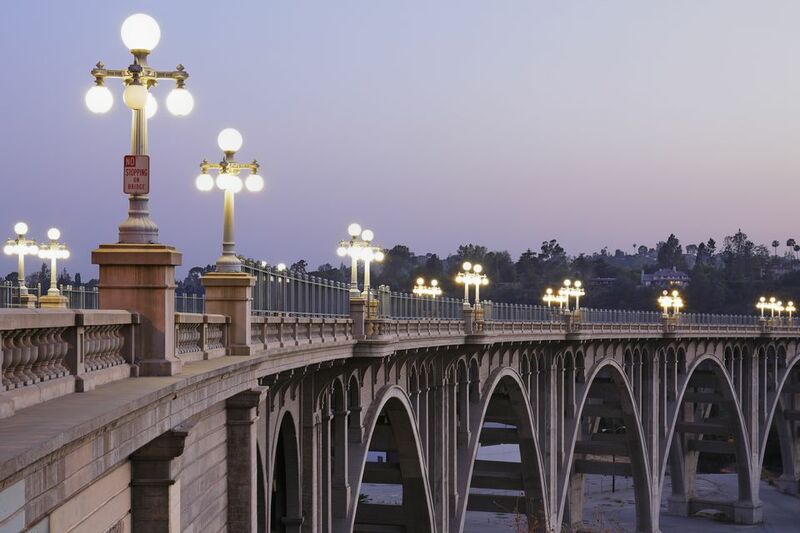 Check our Pasadena lodging guide for advice and strategies to find just the right place to stay. Pasadena is north of downtown Los Angeles. You can get there by driving north on I-110 (which becomes CA Hwy 110 north of downtown) or from I-210, which runs just north of downtown Pasadena. Pasadena is 140 miles from San Diego, 112 miles from Bakersfield and 385 miles from San Francisco. By public transportation, you can take the Gold Line light rail system from downtown Los Angeles, which connects with other segments of the Los Angeles Metro system. The Memorial Park station is on the north edge of Old Town Pasadena. Getting there by public transportation is a good option if you plan to stay in and around the Old Town area but less practical if you want to visit the Gamble House, tour some of the neighborhoods or go to The Huntington.